Aldon 4015-98 Magnetic Locomotive Cab Sign (Stop) 8-1/2" X 15"
Improved design. 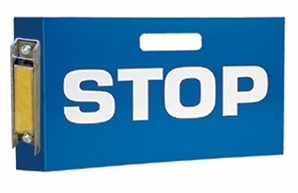 As lightweight as vinyl signs, and with a more powerful magnet. Aluminum sign with wind-resistant rare earth magnet tab. 8.5" x 15". Reflective lettering on both sides. Hand-hole and three holes at bottom for lanterns or lights. Product Reviews for Aldon 4015-98 Magnetic Locomotive Cab Sign (Stop) 8-1/2" X 15"